Dropping 11 Spots to World no. 38, he’s the number 3 Aussie behind De Minaur and Millman. With his ranking outside of the Top 32 required to get a seeding in a grand slam, Nick Kyrgios is in real danger of missing out on a seed in his home tournament. His attitude is catching up to him, just as it did to Tomic. Growing up is never easy for any of us, but it's time for him to make some big decisions. His talent is huge, and he is now used to the money that goes with that talent. Things are changing now. His serve is huge. Not talent. Also very important, Kyrgios' most productive period this year was right at the start, with a win in Brisbane and 4th round at the Aussie Open accounting for like 33% of all his points this year. I don't like Kyrgios but it's still sad watching someone completely self-destruct. Although it’s sad to see him dropping in the rankings, I don’t think he cares a lot about being seeded or not in slams. He’s so hit or miss, sometimes it feels like she’s better of playing seeded players. Finally getting ranked where he deserves is all. And also sad to see someone talented who may simply not like what he is talented in. I see that in my field too, music. There are unbelievably talented musicians who basically don't like the instrument they are talented on and who just quit only to move to something else they still don't make much money in and don't do especially well. Never understood not liking something you're good at. All the things I dislike I'm no good at (which probably explains why I dislike them). However there are several things I like but am not especially good at. He got mental problems that is holding back his full tennis potential! He just have to work them out on the tour! The worst thing that happened to Nick was beating Fed and Nadal early in his career, it gave him a totally distorted view of his own level. As a serve bot, Kyrgios is going to beat top players more than expected and he's going to lose to Bradley Klahn more often than his ranking would predict. When Nick realizes he's losing a match to a lower ranked player, he pretends that he doesn't care so that he won't be embarrassed. Nick just got beat, that's all that happened. Klahn isn't that good but when he's in top form, he can beat an average Nick. Millman and Ebden got ahead of him on the back of two pretty fortunate draws in big events, and a good portion of De Minaur's points are from Brisbane and Sydney early in the year, so we'll have to wait and see how well he can back up those results. I'd still back Kyrgios over both of them talent wise and results wise moving forwards. None of the other Australians have a points distribution that's particularly distorted. They've simply had better years than Kyrgios. 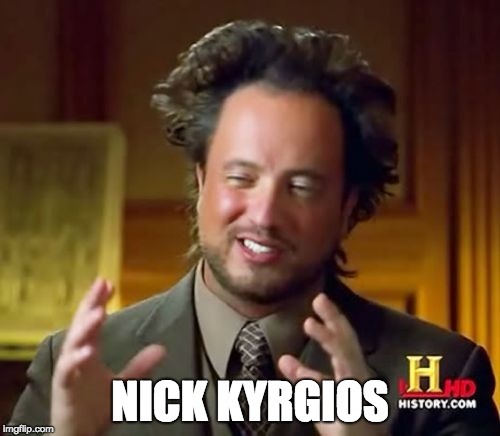 I was a fan of Kyrgios but I’m increasingly getting sick and tired of his antics. Still acting like a brat all the time, and not doing anything to try and fix his mess. That match vs fed flushing meadows, says in the match “I need a coach” and then when asked about it at the press conference, says I didn’t say anything. Results are awful aswell for what he should be getting. Just this past week, getting at the umpire because he warned him about tanking. Knocks down a couple of aces and gets cocky, like mate, you eventually lost the damn match. He’s boring and frustrating at the same time. Needs to fix up asap. His serve is (obviously) his biggest weapon, but he also does everything else at least adequately, and he has a plus forehand and a gifted overall touch/feel. If he had the emotional maturity and mental game to compete consistently, he could be a Top 5-7 player already. His forehand is quite big as well. But apart from that and serve, his talent is very overrated. Maybe, but...how would you compare him to someone like Cilic in terms of talent? (And also consider that Cilic isn't known for having the strongest mental game - though it towers above Nick's). I'd say Cilic's backhand is stronger, but Kyrgios has a better serve, their forehands are about even. Both are okay at the net, and both move well for big guys, with Kyrgios, perhaps, a bit quicker. Neither stands out to me on return of serve. When will he get a coach?